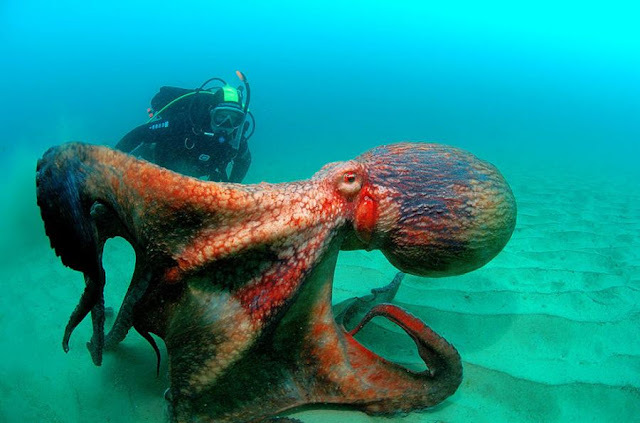 Nothing's like an octopus that wants to hide. 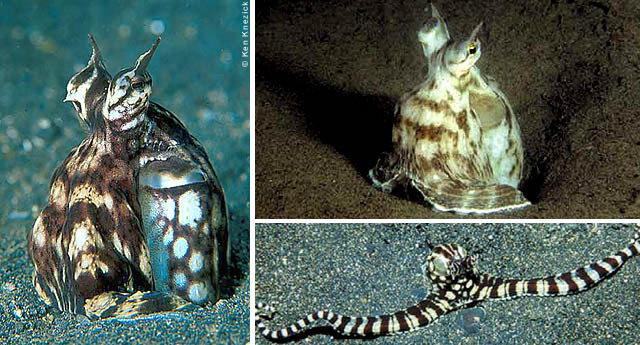 As shown in this impressive video, the Indonesian Mimic Octopus (Thaumoctopus mimicus) can impersonate sea snakes, lionfish, flatfish - and in normal form it looks pretty weird, too. - Loss of sense of touch, speech and the ability to swallow. - Within 3 minutes, paralysis sets in and your body goes into respiratory arrest. 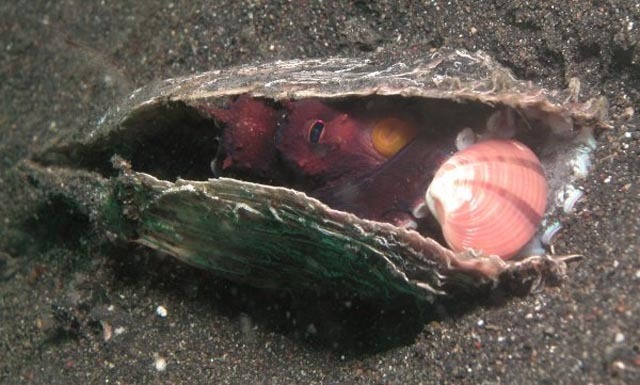 See it live crawling around (and learn to distinguish it from harmless fish and surroundings) - click to watch video. At the end of the video it looks just like a little brown fish innocently swimming by! 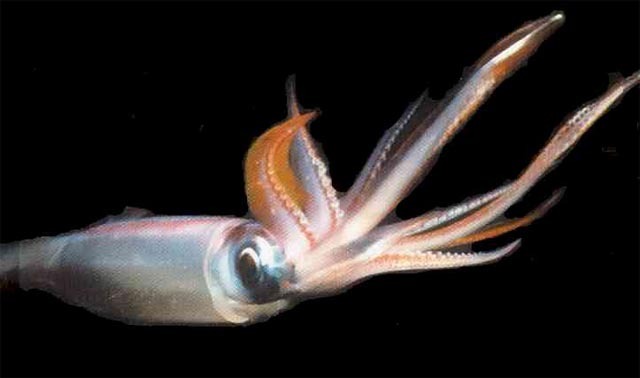 The Colossal Squid is significantly scarier than a giant squid (we are past the "giant" scale now, into the "colossal") - it not only has suckers lined with small teeth on its arms and tentacles, but it also has hooks: sharp, three-pointed kind of hooks, wicked and wickedly efficient. 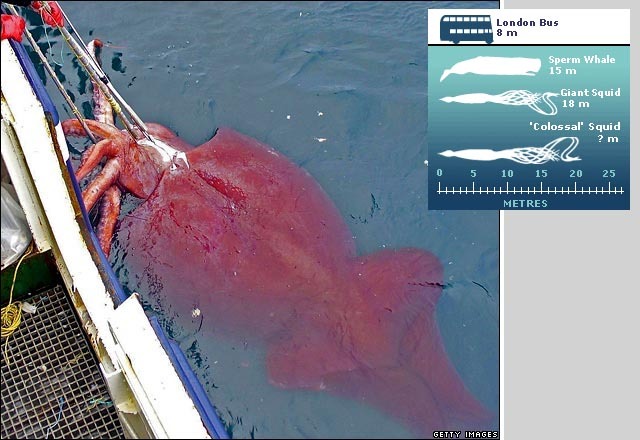 The colossal squid can get as big as 20 meters, which is more than two school buses put together. 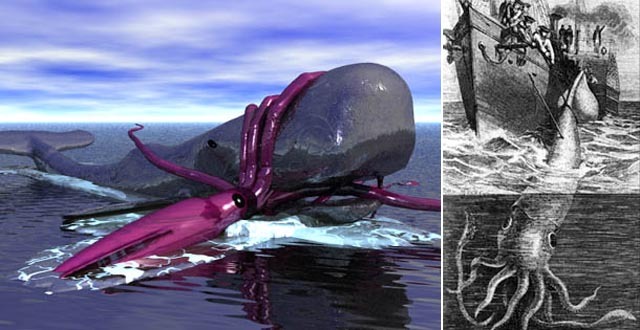 Their other name is the "Giant Cranch" (I'd say, it's pretty graphic...), they have the largest eyes in the animal kingdom and enjoy swimming in the ice-cold Antarctic deep waters. 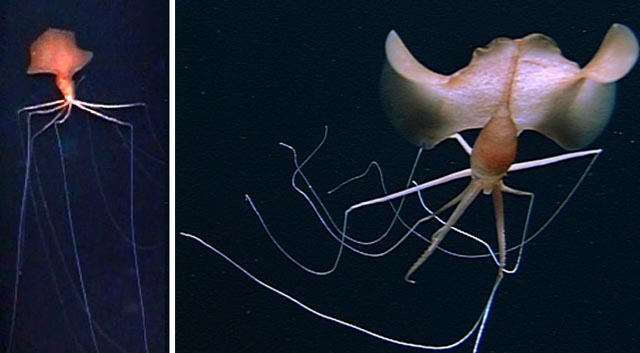 Vampyroteuthis infernalis looks and behaves like it jumped from the fervent concept art portfolio of some CGI studio - for starters, it is able to turn itself inside out (to the utmost confusion of its pursuer). It also perfectly mastered the stealth mode: red color in the pitch blackness of the depths is invisible. Its body is covered with light-producing photophores, so it can also "light up" like a christmas tree. 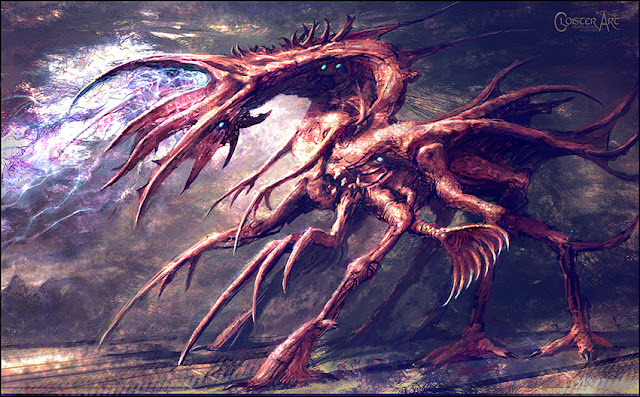 Its arms and tentacles are covered with.... you guessed it, teeth, razor-sharp spikes. 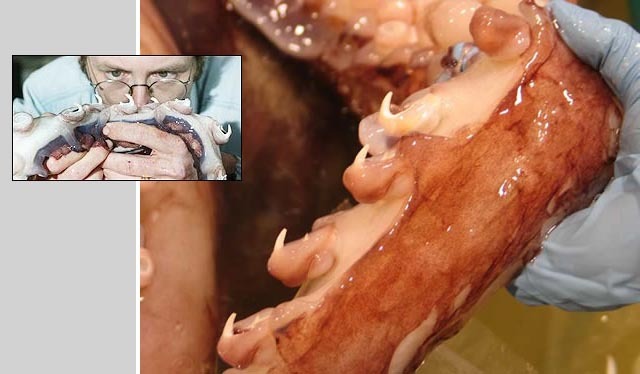 And it's made out of "jelly" rather like a jellyfish, not a normal squid. 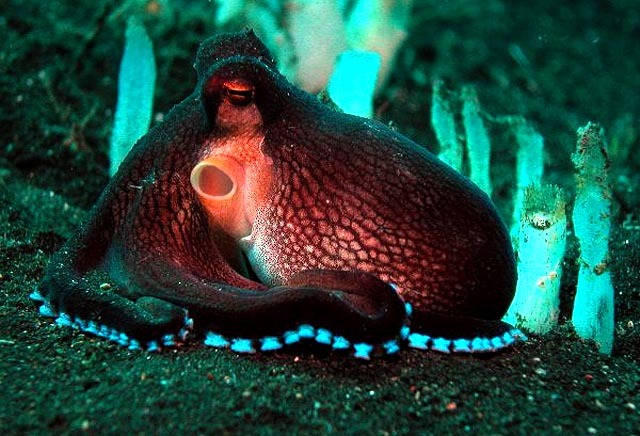 For more cephalopod video, check out the second half of this TED talk. The first half is good too. Wow. Camoflouge is the coolest. I can't believe how quickly it went from looking like a rock covered in algae to it's true self! As soon as I opened this post, I started thinking back to that Magnapinna video. Truly one of the most unearthly things I've ever seen. 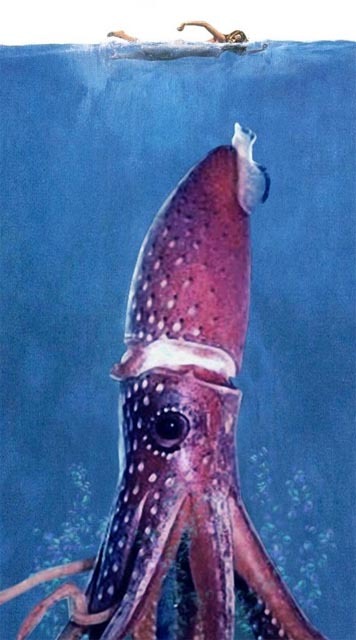 the collosal squid doesnt just have hooked teeth, each one of those teeth can rotate 360 degrees! yes they are all free floating teeth! The vampire squid has such facinating eyes, they almost look like cool blue stones set into its head like gems on a crown. 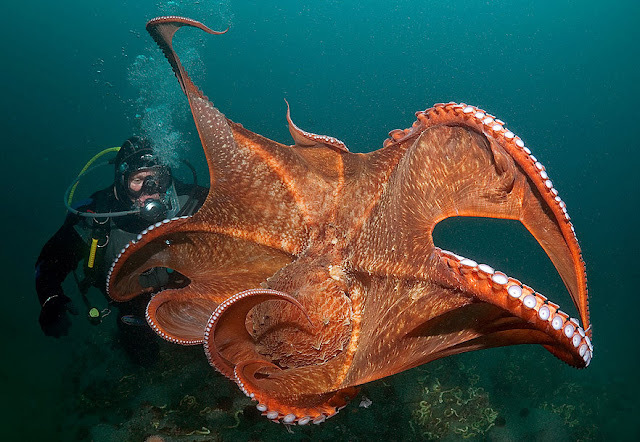 David Taylor (a zoo vet who used to be on TV long before Animal Planet channel existed) had this story in one of his books about how he was supposed to pick up a giant Pacific octopus at the airport. When he opened the box to check, it slithered out, ran across the cargo room, and climbed onto a bicycle. He had a heck of a time untangling it, fortunately it didn't know how to ride.